Infrastructure as a service is basically renting servers off the internet as opposed to having servers located in your office. There are clear advantages to having servers in the cloud. 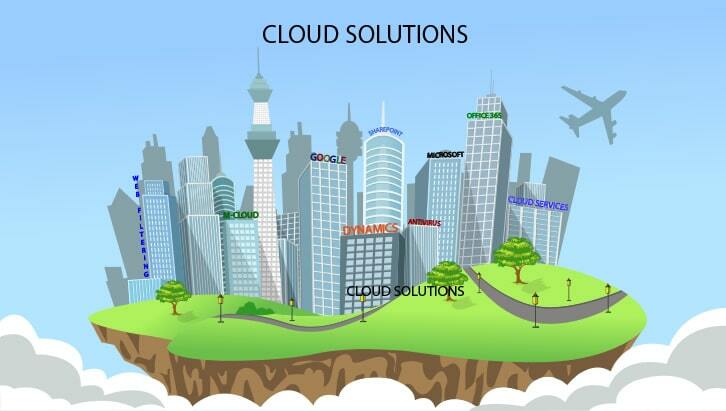 In Mansys, we have developed our own cloud infrastructure which is held in a tier-3 data centre. We have called it the ‘M-Cloud’. Microsoft Office365 refers to Microsoft Office applications provided through the cloud. This is a subscription-based product so you just pay for what you need. Office365 plans provide businesses with the latest version of Microsoft Office and give them the agility of accessing their information from anywhere. Mansys provides Office365 solutions and we can help you obtain the right plan, whether you’re a business, a charity or non-profit organisation. Mansys is a Microsoft Silver Cloud and MidMarket Solutions provider. Online backups are becoming increasingly more popular. You no longer have the headaches of making sure tapes are swapped each day and taken offsite. With our online backup solution, not only can we back up your servers but we can also back up laptops and devices of mobile users. Restore your information to a server in the cloud so your users can continue to work from anywhere. We can provide online backup services for Microsoft, Apple and Linux systems. A web filter is a program that can screen an incoming web page to determine whether some or all of it should not be displayed to the users. The filter checks the origin or content of a web page against a set of rules provided to the company. We provide various different web filtering solutions depending on the security and audit trail you require. Our servers are based in a secure tier-3 data centre, which means we are protected from power outages and other disasters that would normally affect an office that hosts their own. If you want your website hosted in secure, resilient environment, we can host websites based on Linux and Windows platforms. We can register, transfer in and manage your domain names, taking the burden off you having to deal with changes or updates to anything from your DNS settings to your remembering to renew any domains or services. Even a minor outage can put you at a competitive disadvantage. So let Mansys setup a disaster recovery plan for you today. Minimise business risk and downtime and ensure the continuity of your business in the face of unanticipated incidents, by securing your applications and data. We provide hosted (VOIP) Voice-Over-IP solutions. What is VOIP? VOIP allows you to make telephone calls using your internet line instead of the traditional ISDN or analogue lines. VOIP systems can reduce costs of business communications and allow you to use your phone system in ways you never could before. Microsoft Dynamics is a line customer relationship management (CRM) software application. This cloud-based solution allows companies to understand their customers in a completely new way. The software is easy to use with amazing flexibility and productivity and you don’t have to worry about your data because it is secure. We can handle your SharePoint needs for your company. SharePoint is a web-based document management and storage system, but the product is highly configurable and usage varies substantially between organisations. SharePoint allows for storage, retrieval, searching, archiving, tracking, management, and reporting on of electronic documents and records. Many of the functions in this product are designed around various legal, information management, and process requirements in organizations.